I am Reham Almaqtari … I am an interior designer. I did research many times to could choose successful design related to silver ratio metallic means as result of researching I decided to design useful furniture. … I followed the mathematics rules of silver metallic mean through design process. My design is (Stuff table) which can be use in hall and corridors. I choose these kinds of furniture (stuff table) due to I can apply the rule on this objects such as (TV table .stool .stuff table, bar chair). I elicitation my concept from natural life which is (spider net) because the spider net gives a harmony feeling from its shape and details. In addition, a spider net usually grow surrounding by a commensurate and harmony area. Furthermore, I choose my style (Deconstruction style) related to concept, that inspired from pattern and spider shape. I used my color scheme from both style and concept. 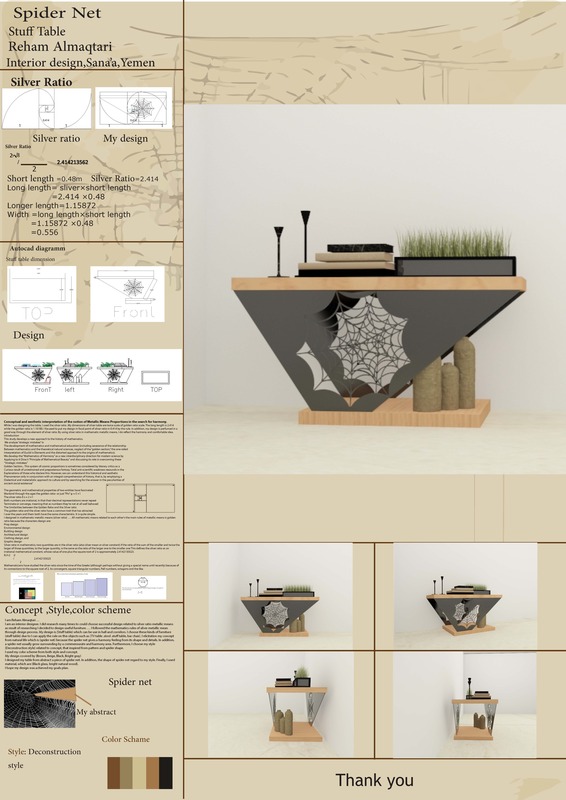 My design covered by (Brown, Beige, Black, Bright gray) I designed my table from abstract a piece of spider net. In addition, the shape of spider net regard to my style. Finally, I used material, which are (Black glass, bright natural wood). I hope my design was achieved my goals plan.